Sun Myung Moon is the founder and leader of the Holy Spirit Association for the Unification of World Christianity, also called the Unification Church, a world-wide organization that believes him to be the "Messiah" sent by God to complete the earthly mission of Jesus. As a teenager in Korea, Moon had a vision of Jesus (1935), who told him he'd been chosen to continue God's fight against evil. Moon founded his church in 1954, but didn't get international attention until moving to the United States in the early '70s. He ran afoul of the U.S. congress in 1976 and was investigated for his business dealings and his connections to the CIA in Korea. The investigation, denounced by Senator Orrin Hatch and other conservative politicians, culminated with Moon spending 13 months in prison (1981-2) for conspiracy and filing false tax returns. Reverend Moon has been attacked as a cult leader, but his church (now called the Family Federation for World Peace and Unification) continues to have hundreds of thousands of members (often referred to as "Moonies") and holdings in educational and media institutions, including the political journal The Washington Times. He and 15 others were involved in a helicopter crash in South Korea on 19 July 2008. Moon and other were injured, but none seroiusly, according to news reports... In a single ceremony in 1995 Moon claimed to have given 360,000 couples the marriage blessing of God, with he and his wife in the role of the "True Parents" of humanity... Moon, a South Korean citizen, was given permanent residency status in the U.S. in 1973... He celebrates his birthday according to Korean tradition -- his first birthday was the day he was born, his 90th was the day he turned 89 (by Western standards). 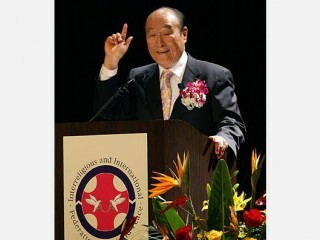 View the full website biography of Sun Myung Moon.